Here’s a recent report from Barb Wooler, who is in Nepal with Reach Global, along with a post from her Kathmandu Diary. If you’d still like to give to providing homes or community centers for the people who have been impacted by the recent earthquakes, click here. For up-to-date news from Barb, follow her Facebook page, and continue to pray for her ministry there. Barb is the director of crisis response for Encompass World Partners. According to reports from my colleagues at Encompass, you folks have been doing some HEAVY LIFTING in terms of giving to help Nepali people! Just 25 or so homes left to be financed in order to meet our goal of 300!! 4 – a classroom where children’s ministry can take place. With children not in school now, they have a lot of free time, too much, and it’ll be healthier for them to a really positive, encounter as part of their daily routines. BOTTOM LINE: If you had settled in your heart to give and have not yet sent it in, please consider following through with your intention. We’ll turn it into something really special for the kingdom, and that’s a promise! 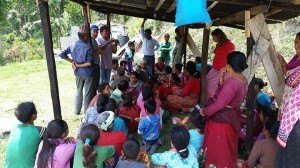 KATHMANDU DIARY, DAY #5 – This was our most intense day of ministry yet. We traveled three hours to an outlying mountainous region that was utterly devastated by the earthquakes/aftershocks. We went to comfort and encourage the people at a church with a tragic story. The first earthquake (Ap 25) hit while people were in church worshiping. The church building in the village we visited yesterday collapsed, killing 8 people, including the wife and three children of the pastor. When we arrived, we found about 30 people quietly waiting for us. It was obvious they were in mourning and were still suffering deeply from their trauma. One of the things we did while we were there was break up into small groups and talk about What happened: The facts, their thoughts, and their feelings. Our time was closed with an amazing time of prayer, Nepalese style. It was deeply touching. 2 – We met just ten yards from the collapsed church building under which lie two bodies that have yet to be recovered. Our partner, Reach Global, will be returning soon to this village with a large truck to help remove the collapsed two story concrete structure (see photo), what a Nepalese brother called their “shame”.